The Torrey Pines Logic Deadeye Scope Mount for GoPro HERO3/HERO3+/HERO4 gives you a scope's eye view, allowing your GoPro action camera to record exactly what the reticle shows. This mount is compatible with most scopes featuring eye relief from 85 to 100 mm that have a neck diameter between 30 and 36 mm. Box Dimensions (LxWxH) 10.2 x 8.3 x 4.7"
Deadeye Scope Mount for GoPro HERO3/HERO3+/HERO4 is rated 4.8 out of 5 by 6. Rated 5 out of 5 by Eodman from Great addition to your ground squirrel shoot I bought This about a year ago and was amazed how easy the installation was. I mounted it on a Leupold 30 mill tube Varmit scope. The rifle is an AR in 204 Ruger. After a day of shooting I was able to watch the shots over and was very happy with the results. I mounted the Deadeye on a scoped 338 Lapua Magnum AR style rifle. It handled the recoil with no movement and the recordings are perfect. I will buy another one soon. These are not some piece of junk that you hang your Cell Phone on. These are Mil Spec and top of the line. When you go to the range you spend most of the day answering questions from the other shooters. Rated 4 out of 5 by Anonymous from Well made, good manufacturer support, heavy I use this professionally for YouTube. It's very well constructed, uses real glass for lenses and an OEM Gopro housing with proprietary clip. 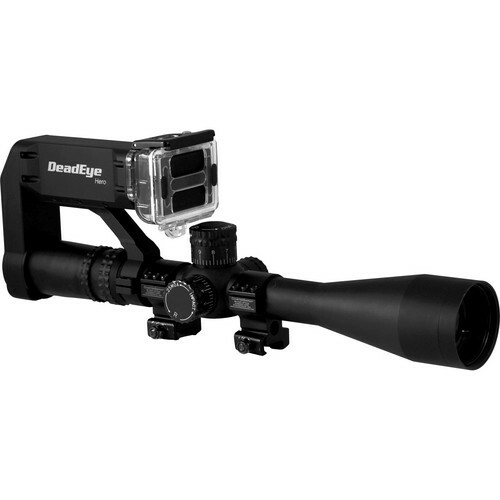 It's very adjustable for length of scope as well as diameter. With my Hero 4, it works great and support from Torrey Pines has been superb. Two things they don't tell you in the BH description... it's quite heavy and will add over a pound to your setup, and that you can easily see through the scope without a monitor for the Gopro. Rated 5 out of 5 by MCLMM from Great Product I bought this to use on a S&B 3-20 Ultra Short. Unfortunately it will not mount on that scope due to the length from the occular to the 34mm tube past the illumination housing. This length is longer than the adjustment on the slider. I notified Torrey Pines about the issue and they are working on it on their end. They even agreed to sell me a spare set of parts to allow me to machine an interface to mount it directly to a Spuhr scope mount. They have been extremely helpful. It works great on another scope I own. Even though it is an expensive item, it is well worth it. We do not have a firm date from this manufacturer. Please sign up for an e-mail notification on the product webpage. Can you still see through the scope with the camera recording? Enter an anI want to buy this product.I wonder if when the product is in stock.swer to this question.